It's very rare you're going to meet a family that are happy just spending willy-nilly (did I really just say that? I think I did) The more additions you have to your brood the chances are the tighter your purse strings get. Babies are generally pretty expensive, taking into account for formula, nappies and then the fantastic new wardrobe they need every 3 months. Life can be pretty darn costly. I recently took part in a Twitter chat which focused on family money saving tips, I truly enjoyed it as it really gave me some fantastic ideas I'd never have thought of otherwise. Today I'm going to share some of those, in the hope you too will be pleasantly surprised by just how easy it can be to save those extra pennies as a family. My first tip is buy disposable coffee cups. This has saved me an absolute fortune. Before maternity leave I was spending at least £3 a day on a coffee each morning, our local petrol station had a Costa machine which I felt I pretty much funded myself. Three pound doesn't seem that much, but that adds up to £15 a week and £60 a month - ridiculous. I bought a set of 10 disposable cups from Home bargains, paying a simple £1 and make myself a coffee to take with me each morning. Now I pay £2 a month for my coffee - what a saving. Create your own dryer sheets. I could spend a pretty penny on fabric softener. I love our clothes to small beautiful, you know the type of person when you walk past in the street they smell like fresh washing? Yeah that's what I enjoy. I realised the best way to achieve this was to use a simple dish sponge, pop some fabric softener in a bowl then press the sponge into it, letting it soak up all the softener. Then whack it in your dryer when you're putting your washing in and viola! Not only does it make your clothes smell fantastic, you save a fortune in fabric softener and your whole house smells great too. Buy shopping with gift cards. I saw this trick on Twitter and couldn't believe what a genius idea it was, simply buy a certain amount of money on a gift card for your supermarket of choice. Then leave the rest of your purse at home, just taking the gift card with you. You're not tempted to overspend for the sake of it. It also works for withdrawing money to do just the same. Set yourself monthly or weekly challenges. Each month, come together and decide what you're giving up that month. I've seen others give up buying toiletries for a whole month, or having packed lunches only for work that month. It can really add up if you're eating food out each week at work. This month we gave up takeaways, and even if it's just a £40 saving - when combined with some of the others above, it really does make a huge difference. Always, ALWAYS, google for a coupon when you're about to buy online. It's very rare I can't find something for stores I am about to buy from, whether it's just free delivery or 10% off, it's money you wouldn't have saved if you hadn't checked first. Book online food shops in advance. It's something I've noticed lately, but if I leave the weekly Monday shop, till a Sunday night to book, then the slots for the next day are absolutely extortionate. £7 just for the privileged of a delivery. If you book a week or so in advance, you can usually get exactly the same slot for a third of the price. Even if you just add some essentials to the trolley before checking out - set a reminder in your phone to log back on in 5 days time to add the things you really need. 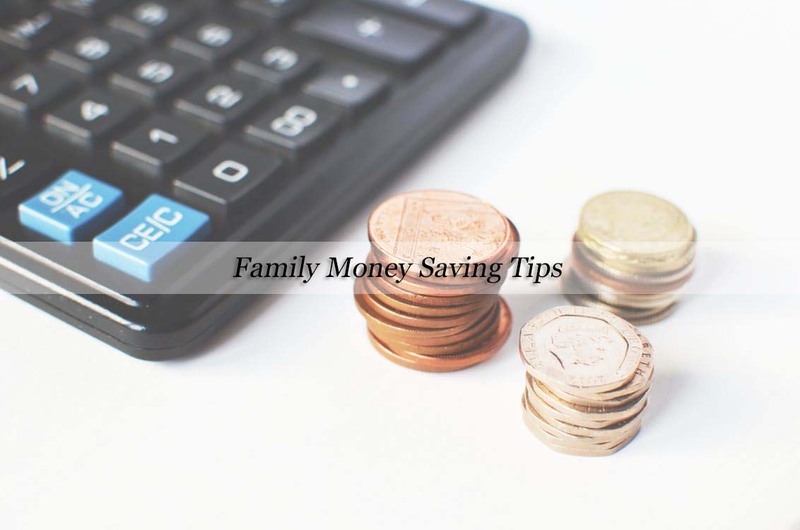 Saving money as a family really is a lot easier than I thought, there are so many sites out there offering free advice, tips and hacks on how you can really save those extra pennies. What seems like a few pounds here and there really does add up, so it's definitely worth checking out where you could be saving that little bit more. Make sure to check out the super handy infographic below for some extra details on how you can save around the home. Love the make your own dryer sheet idea!!! Every little helps with the saving and I am constantly reviewing our savings! Setting monthly or weekly targets is the way to go! Great tips Emily! I love looking for discounts online. They save me so much! it's a standard medical proven fact that foods have a really giant role to play within the state of our health. Educate your family concerning sensible and unhealthy food habits, however what higher education there's than providing wholesome and nutritive foods for the family as a start line.